It was said about “Protect” MN’s former “executive director” (and pretty much sole member) Heather Martens  that “she never once made a single subsantial, original, true statement about the Second Amendment, gun facts or gun rights”. When The Right Reverend Nancy Nord Bence took over at “Protect” MN a few weeks back, we had hope that things might change at Minnesota’s “leading” criminal-safety group . In her press release related to this past Tuesday’s events at the SLOB, we see that hope was misplaced – with hilarious results. Good news: The Senate Judiciary Committee hearing was a great success! And by the standards of”Protect” MN, it probably was. Their all-out effort turned out about as many people as the Human Rights community’s casual call for supporters with spare time did. None of their people were ejected from the building for trying to pick a fight with Human Rights supporters. None of their paid lobbyists appeared in the place of an elected official, to immense ridicule. By their standards, it was a red-letter day. On Tuesday, April 26, hundreds of Minnesotans who have had ENOUGH gathered at the Senate Office Building in St. Paul for an informational hearing on legislation that will go a long way towards protecting Minnesotans from gun violence: Senator Latz’ universal background check bill (S.F. 2493) and gun violence protective order bill (S.F. 2980). Let’s go through the lies in order. 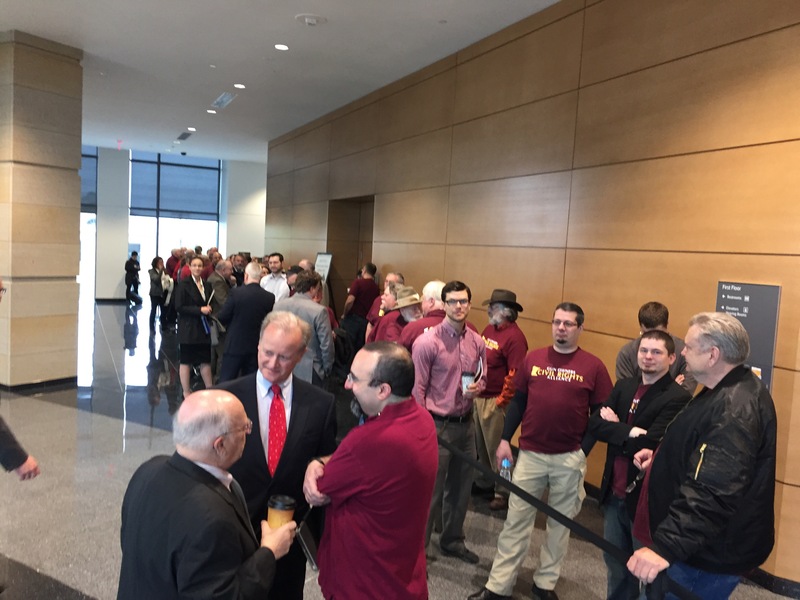 “Protect” MN is apparenetly taking counting lessons from the Strib: there were not “Hundreds of supporters. 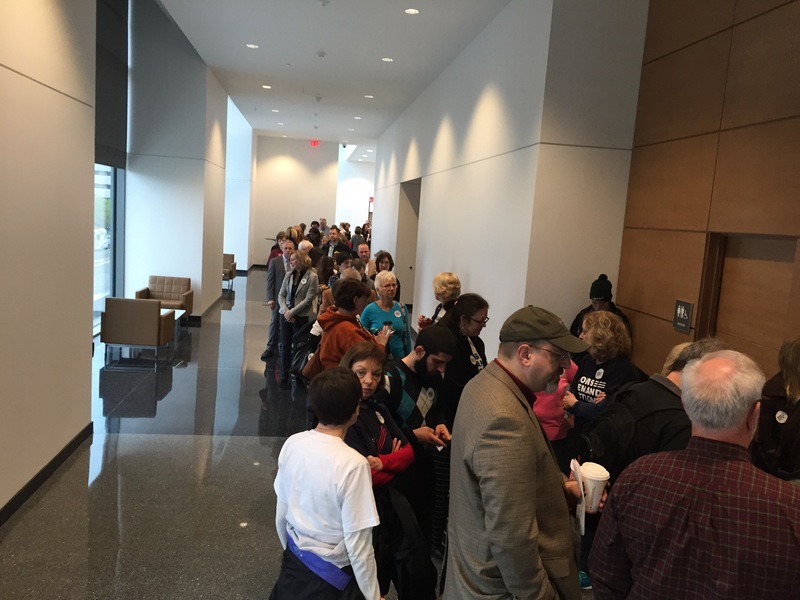 As people were let into the hearing, there were roughly 150 all together – about equally divided between criminal-safety advocates and Human Rights supporters. A count as the doors opened showed roughly 70-80 on each side. A few more streamed in on both sides – but the chamber, which held 250, was never close to full. Fact: “Protect” MN has never turned out “hundreds” of people in a given session, much less at a single event. Second lie? It wasn’t an “informational hearing”. It was a sham; a Potemkin hearing, trying to create the illusion that these two bills aren’t utterly dead issues this session. It was, in other words, a campaign event, held at taxpayer expense. Third? Neither bill will ever save a single life. Ever! Universal registration will only burden the law-abiding. And the “Take Your Soon-To-Be-Estranged Sig-Other’s Guns Without Due Process!” bill is nothing but a make-work program for lawyers. Scheduled to coincide with the Moms Demand Action lobby day, the room was packed with enthusiastic Moms as well as Protect Minnesota members. The gun lobby was also out in force. I’m just going to let the word “packed” lie there, like the magnificant rhetorical turd it is. Although no action will be taken on these bills this session, this informational hearing was important and very successful. It captured the attention of the media, disputed the gun lobby’s false claims, “set the table” for the debate that will ensue in months to come, and fired up the masses of gun safety supporters in attendance. Fourth lie: The media coverage was sparse and perfunctory. Fifth Lie: “Disputing” doesn’t make anything “false”; you can “dispute” gravity, but if you don’t float away afterward, you’ve falsified nothing. We commend Senator Ron Latz for his bold leadership on this issue, and commit the whole resources of Protect Minnesota to assisting in the passage of these bills in 2017. It may not be a “lie” to say Latz is a “leader” on the issue. He’s doing what Michael Bloomberg told him to do. Meet the new “Protect”MN. Same as the old “Protect”MN. Said by me, of course – but known by everyone who actually paid attention to the issue. At all. Ever. In the same sense that Timberwolves fans “hope” that this will be the big year they’ve been waiting for. This entry was posted in Lie First, Lie Always, Uncategorized, Victim Disarmament and tagged lie, Rev. Nancy Nord Bence by Mitch Berg. Bookmark the permalink. Print (don’t Email) this out in an appropriate format and mail it to Glen Taylor %Strib and ask him why he wants his name associated with such a demonstrably shoddy product. Its time he was held accountable. It’s so sad that the Senate Majority Leader declined Senator Latz’s impassioned pleas – and the hundreds of calls and letters undoubtedly received from Moms – to move this bill to the floor of the senate in an election year. Why, it’s almost as if the DFL majority is more concerned about keeping their phony-baloney jobs than making grand, self-defeating, empty gestures. It was a huge success, as for the first time in ages, they weren’t outnumbered at least 5:1, no? And they are radical. Radicals aren’t the ones who want to turn a country upside down and inside out. Radicals are they ones who want to maintain it as is. Similarly it a radical belief that men use the men’s room, and women use the woman’s room. Also up is down, and down is up.